Your parking lot is your public’s first impression of your business. Ensure you’re making a good one with coating and painting services that not only revive the appearance of your parking lot, but protect it against hazards like crumbling, fading, and spider cracking. To learn more about how parking lot coating and painting can benefit you Waco and Temple, TX business, call our experts at 254-716-8685 today. Regular parking lot painting not just ensures that your parking spaces and lines are easy to see, but also keeps you compliant with the ADA (Americans With Disabilities Act). In fact, regular painting can increase traffic flow through your business due to aesthetic appeal and ease of access. Other than painting, you can help keep your parking lot presentable by having professional parking lot paint and coatings applied. These coatings prevent normal wear and tear from traffic and vehicles while protecting against water infiltration, crumbling, and cracking. A parking lot coating in Waco and Temple, TX seal your parking lot to eliminate debris, water, and other foreign objects from getting into your concrete and causing friction that breaks down its components. This will allow your concrete to stay sturdy and reach its maximum lifespan. Call us now at 254-716-8685. If you’re considering parking lot coatings in Waco and Temple, TX, our professionals have got you covered. We provide a comprehensive service that begins with a thorough inspection of your surface to identify weak points and main dangers. We will discuss your coating or painting options with you and provide detailed descriptions of your product and material choices so you are able to make educated decisions for your parking lot. When you need expert parking lot painting or parking lot coatings, call our professionals first for a finished product that stands up to the elements. For an unbeatable parking lot that crushes your competition, call the eSquared Asphalt Maintenance experts today. 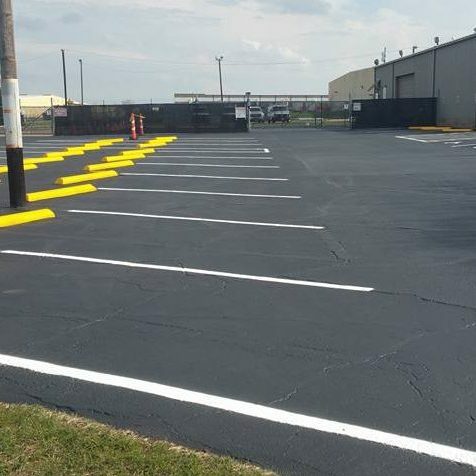 We can provide quick, affordable parking lot painting and parking lot coating throughout the Waco and Temple, TX area for a surface that provides maximum stability and aesthetics for everyone who drives on it. Call us today at 254-716-8685. Updated on March 22, 2019 at 3:24 pm by eSquared Asphalt Maintenance.